An estimated three hundred and four million of them across the globe, and yet researchers are noticing many inland lakes are beginning to dry. In Siberia, Central Asia, East Africa, and North America – the results are the same – lakes simply cannot compete with man-made alterations to the environment. These are not just small lakes, some of the lakes with dropping water levels are gigantic in size. There are 122 large lakes in the world each over 1000 square kilometers (386 square miles). Lake Victoria, in Africa, is the largest tropical lake in the world at 68,800 square kilometers (26,560 square miles). Mounting water-level decline in this lake is slowly eroding the livelihood of local fisherman and ranchers, agricultural producers, and industrial water users near the lake. A lack of suitable drinking water or dependable power supply is also becoming more common in the region. Morning Edition on NPR recently aired a segment on Lake Victoria by corespondent Jessica Partnow: ‘Battle for Resources Grows as Lake Victoria Shrinks‘. She has also reported on dropping water levels in Lake Haramaya in Africa for World Vision Report. Sometimes occasional fluctuations of water levels in lakes are natural, but the current rate that many lakes are beginning to go dry throughout the world is not. Humans alter the natural environment near lakes and water levels decline. We build dams, over-pump rivers, over-use groundwater, put roads and parking lots in natural recharge areas, build industries in locations without enough water, over-irrigate our crops, and, often, we use too much water in our homes. Not to mention the effect of a changing climate on water supply sources. But, some things that could help ‘decline’ at least some of this water-level decline include: conservation, conservation, conservation – grow crops in regions they are acclimated (low-water crops) – alternative water supply sources such as rainwater harvesting systems – pursue green “water conservative” development techniques – reduce the pavement – rethink industrial production – low impact living – conservation, conservation, conservation. Ashoka’s Changemakers and Global Water Challenge have partnered to open a worldwide search for ideas and projects that, when scaled-up, have the potential to transform the provision of sanitation and water. All entries are due by Wednesday, March 26, 2008 6:00 pm EST (21:00 GMT). Affordable household filters that remove arsenic and microbes. Biosand water filters in India. Implementation of water harvesting ponds in Ethiopia. Solar water-distillation for potable water. Listen to this excerpt on the ‘Global Water Challenge’ Competition from today’s edition of Marketplace! Could raindrops be another form of alternative, renewable, and sustainable energy? Experimental research is underway by a team at the Atomic Energy Commission (CEA) in France to study the feasibility of rain and energy production, according to a recent article in New Scientist (Issue 2640, 24 January 2008, page 30). The team used piezoelectric materials, which generate electricity with mechanical stress, to capture energy from raindrops as they hit the surface. Raindrops the size of drizzle produced approximately 2 microjoules of energy, while large raindrops produced approximately 1 millijoule of energy. Other research is being completed around the world to review possibilities of new forms of water energy including Damless Energy, Blue Energy, and Ocean Energy Thermal Conversion (OTEC). Animated photo courtesy Ernst Schütz. The new Bank of America Building at One Bryant Park in New York City is often billed as the “greenest skyscraper” in the world. Modeled after Four Times Square, another sustainable structure in the vicinity, the Bank of America Building recycles waste, air, water, and energy. This sustainable concept will result in a 50 percent decrease in potable water required for the building, as well as a reduction in stormwater output by over 95 percent. No small feat for the second largest building in New York City (just below the Empire State Building) scheduled to open sometime this year. Such sustainable development will greatly lower water consumption. To meet LEED Platinum designation, for which this project strives, many measures will be implemented that focus solely on water conservation. A living roof used to retain water during rain events, eliminate the need for stormwater retention, and regulate temperature in the building naturally. Additionally, rainwater will be collected for storage in four locations. This water will be used for flush toilets and a cooling system. Greywater will be treated and re-used for maximum net benefits. Inside the building, waterless urinals and low-flow fixtures will decrease use of this precious resource. The waterless urinals alone will save over 3 million gallons of water each year! In the basement, there will be 44 ice-tanks (each as big as a room) filled with treated greywater and frozen at night. These over-sized ice-cubes are a low-cost way to cool the building during the day as they melt. And, as contractors excavated a large portion of the ground to build a solid base for the 54-story building, pockets of water were found in fissures of the rock. Instead of the usual pumping and dumping of this “fissure-water”, they were connected to a storage system in the base of the building. This groundwater, combined with steam condensation and air-conditioning condensation, will be mildly treated for use with flush toilets and the cooling system. Water-savings at One Bryant Park are huge! The New York City Department of Environmental Protection agrees. Accordingly, they reduced water-fees for the Bank of America Building by 25 percent. Overall, the Durst Organization states the project has been economically reasonable, with payback to occur in less than five-years and considerable long-term savings in water and energy costs. It gives me hope to see massive high-rises implementing such sustainable building techniques. It affirms that technology is available and economically viable. If humans can build sustainable structures over 1,200 feet (366 meters) tall, then certainly we can build sustainable small buildings and homes. This makes me happy. 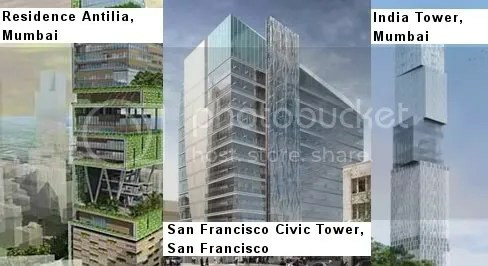 One Bryant Park is not the only superstructure on Earth implementing “green-building” techniques with such progressive methods of water conservation. This informative web-blog post, 15 Greenest Buildings in the World, on Geek About highlights fourteen others. There are many quick contenders around the world including the India Tower and the Residence Antilla in Mumbai. Some of the background for this article came from the great series on PBS, ‘design – e2: the economics of being environmentally conscious‘.